While on a college visit with my son, I swore I ate the best Reuben sandwich that ever existed. After we spent the morning walking around and exploring the campus, we were more than ready for lunch. The BEST Reuben sandwich that I ever had! Keeping with our tradition of supporting local restaurant establishments, we asked the staff where we could get the best lunch. Without hesitation, everyone recommended the same local tavern. And they all said that we needed to try the Reuben sandwich and chili. We were convinced and headed there to see what all the fuss was about. When we arrived, the restaurant was packed full of customers. We got lucky and got seated at the last available table. 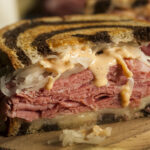 Marble rye bread makes the best Reuben sandwich. As I looked over the menu, I began to second guess what I was going to order. You see, I have never been a huge fan of Reuben sandwiches. First of all, I rarely ate rye bread. It just wasn’t something that I grew up eating. Although I enjoyed the taste of sweet breads, and wasn’t sure that rye bread would satisfy my taste. And then there is the other kicker, sauerkraut. I only ate it on New Year’s Eve when we had to eat the pork and sauerkraut for our good luck meal. However, because everyone kept saying that this was the Best Reuben sandwich around, I decided to order it anyway. Sliced corned beef ready to be heated and added to the sandwich. When the server brought out the sandwich, it looked amazing! In front of me was a huge stack of corned beef surrounded by two layers of melted Swiss cheese. A thin layer of sauerkraut drizzled with Thousand Island dressing sat just below the top piece of the marble rye bread. Now it was time for the taste test…. I took one bite into the perfectly grilled sandwich and I was hooked! So much in fact, that there wasn’t a single crumb left on my plate when I was finished. It is best to use two pieces of Swiss cheese for every sandwich. I loved it so much that I had to find out what their secret was to making the Best Reuben sandwich. To replicate the sandwich there were a few tips that they gave me. First of all, they stated that they only use marble rye bread. 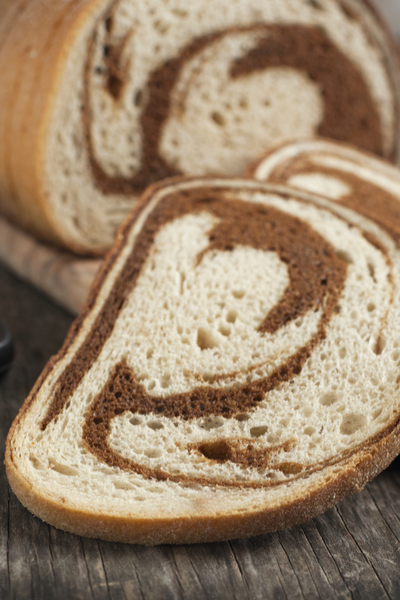 The addition of the cocoa powder to make the dark swirl adds a little variation to the flavor of the bread. Cocoa in my bread, no wonder why I liked it! But then they went on to explain that they only used fresh made corned beef. No deli slices served here! And their final tip, heat the corned beef and sauerkraut separately before adding it to the bread for grilling. Slice the Reuben in half for easy eating! If you attempt to stack everything together and then grill it, you end up with bread that is dry and overdone. 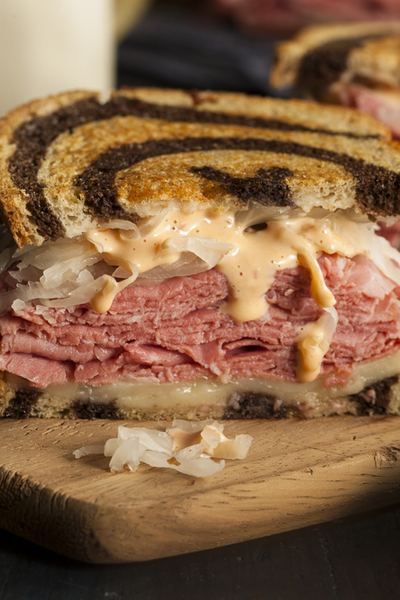 And not to mention, the center of the Reuben will still be cold. So I put their advice to the test, and I now make the BEST Reuben sandwich right in my own kitchen! And of course, my son requests chili to be served with it each and every time! 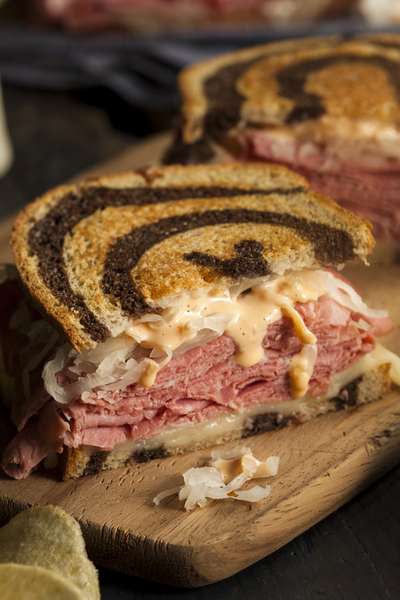 A sandwich packed with bold flavors that is made with rye bread loaded with corned beef, Swiss cheese, and sauerkraut, and topped with thousand Island dressing and grilled to perfection. Heat 2 large skillets over medium heat. Butter each piece of marble rye bread on one side. Spread thousand island dressing evenly on each piece of the bread on the non-buttered side and top each with a piece of Swiss cheese. Place 2 pieces of the prepared buttered bread (with the dressing and cheese) into one skillet and begin to brown. In the other skillet, heat the corned beef in one half of the skillet and the drained sauerkraut in the other half. 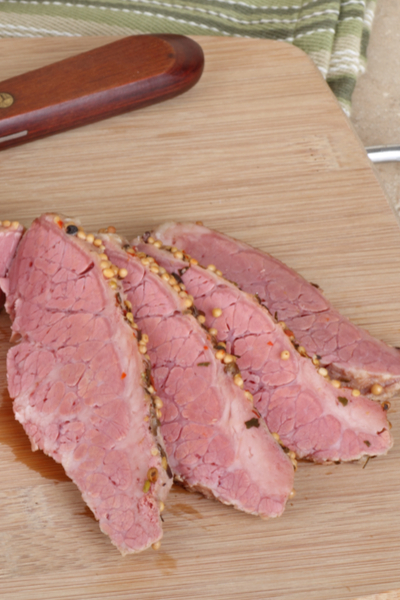 Once the corned beef and sauerkraut is heated through, top each piece of the toasted rye bread with half of the sauerkraut mixture and 4 slices of the corned beef. 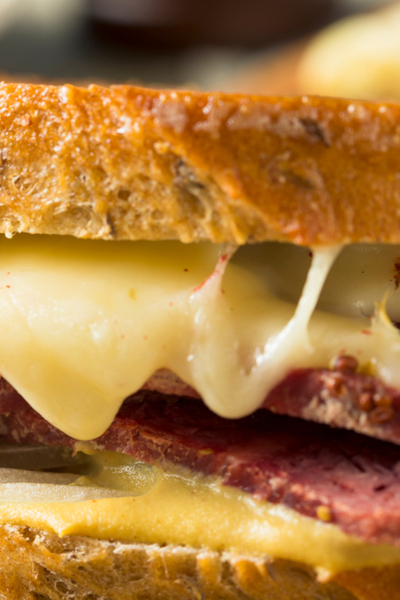 Place the remaining 2 slices of prepared bread and cheese on top of the corned beef and flip. Grill until nicely golden brown.